I'll certainly remember this birthday weekend! 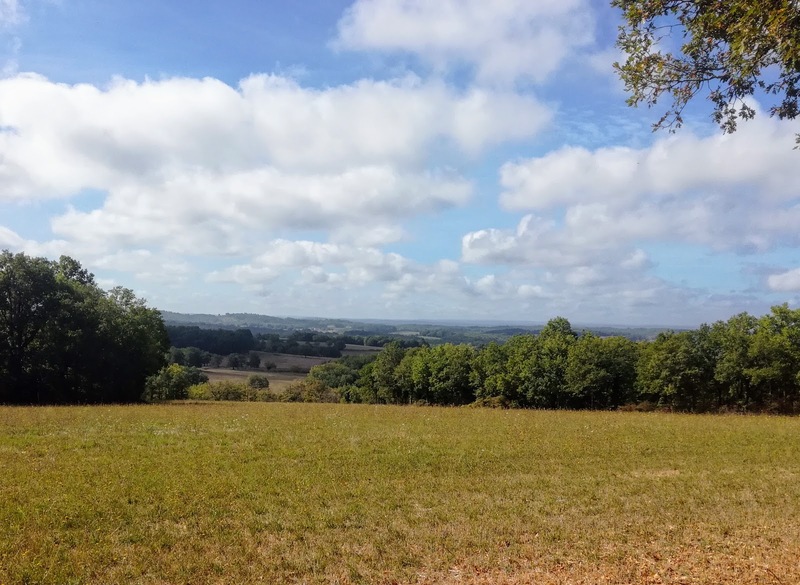 Horizons Unlimited is a website set up by a couple of adventure bikers. Over the years they have organised meetings for other adventure bikers. 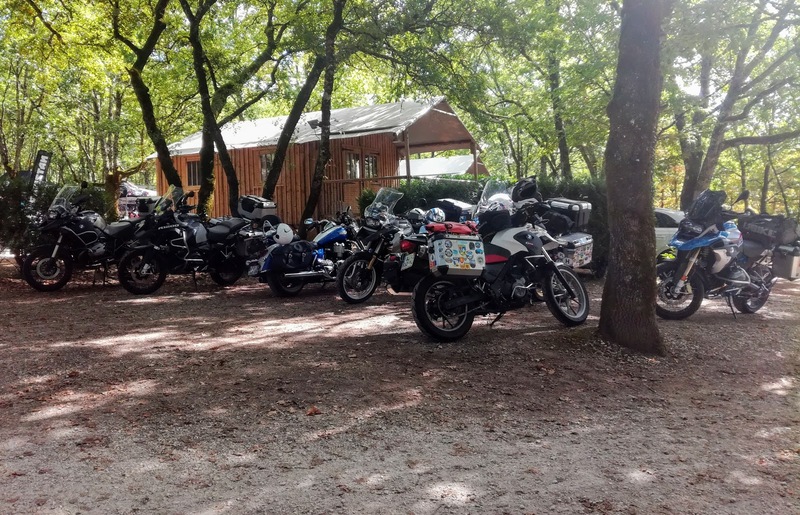 The French branch had its meeting this year in Loupiac near Rocamadour. Although I'm hardly an 'adventure biker', I love hearing about the adventures of incredible people who have travelled around the world. For me, getting to Loupiac is an adventure. 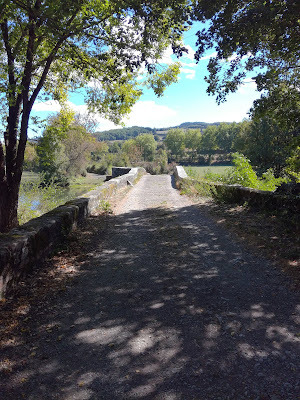 I left home at 8.30am, stopped for coffee and lunch and got to Loupiac at about 3pm. 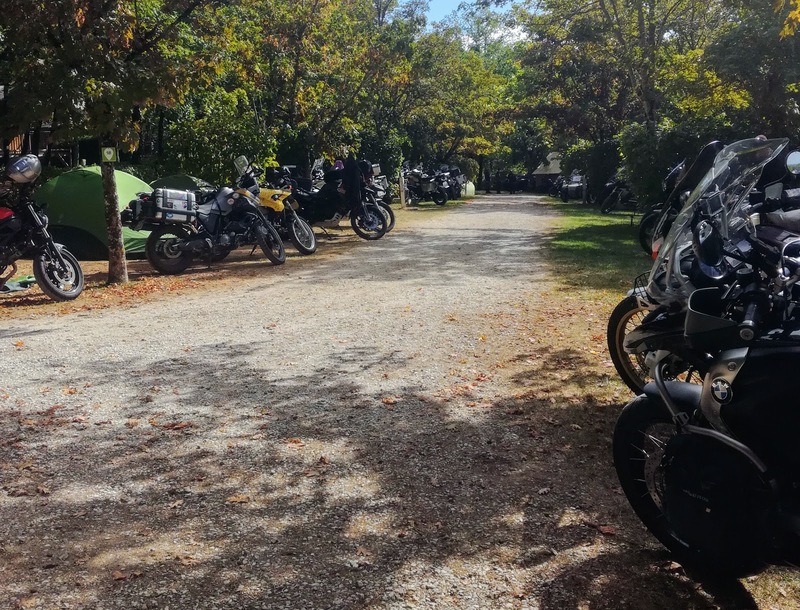 The bike meeting was taking place at the Camping les Hirondelles which is where most of the other participants were staying too. 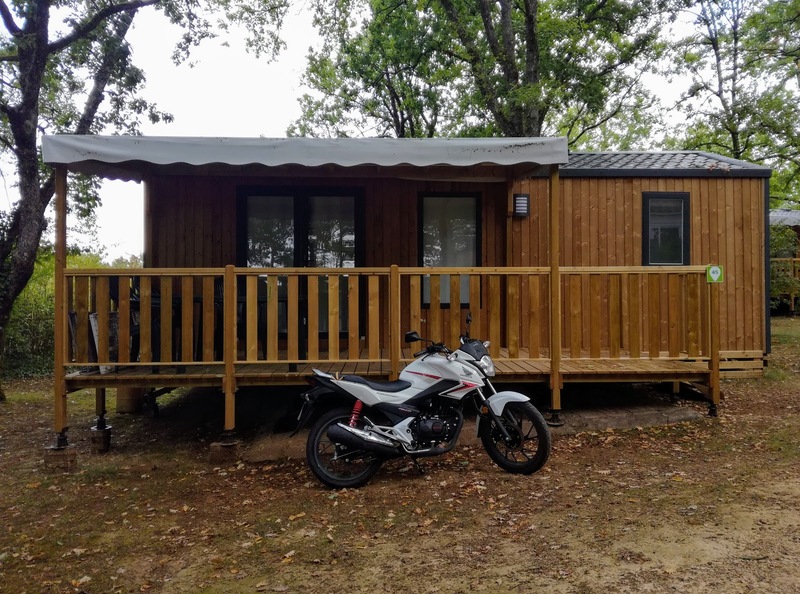 We had a mobile home (with hot shower) so it was la luxe! Many other hardy bikers were camping... by choice. The BMW is the adventure bike of choice for many. I watched a presentation by Eric Lobo called Arctic Dream on his amazing journey both physically and spiritually across Russia and through Alaska with the aim of riding the polar ice road to Tuktoyatuk, a road which ceased to exist from this year. He faced minus seventy-four degrees C, a polar tornado, and recalcitrant authorities, but with help from unexpected quarters, and the addition of skis to his Harley Davidson bike, he made it. Everyone who watched his film left it moved by the experience. 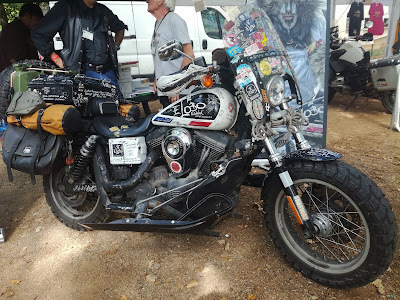 I watched other presentations by bikers who had travelled across Europe and Asia to Mongolia, and even Japan; one who had ridden to and around Iran; and another who had been down South America. It didn't matter where they had been, they all said that the encounters with people along the way was what marked them the most. They came back with the most amazing, stunning photos, and films shot while riding or from drones. Some showed scenery that stretched as far as the eye could see across the steppes, others showed problems encountered along the way - bikes that had fallen down, or broken down, terrible traffic, an accident... One of the most important things about adventure biking is how to deal with issues and problems, especially when on a tight budget! 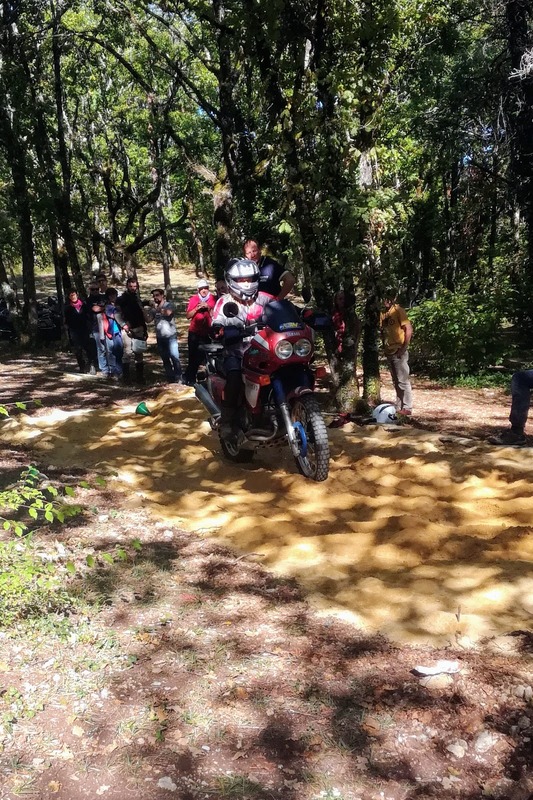 During the weekend, some bikers were taken through their paces on the campsite on a little course among the trees that included a large sand pit that they had to navigate with the help of a professional trainer. That was great fun to watch. I did not join in as I'm hardly experienced enough, and don't even have my biker's licence. I expected a lot of ribald joking about my little Honda 125, but everyone was very nice, and said they had started on something similar, and what fun they'd had. The most popular bike was of course the BMW GS1200 but there were all sorts although only one 125! Funnily enough, on the way up, I was riding along the road about 150 km from Loupiac when a biker who had been taking a break took to the road in front of me. I wondered if he was going to the meeting, and I suppose he did too, because we ended up riding the rest of the way together. He very kindly held back because I respect the speed limit and go up hills with difficulty. We got to say hello once at the campsite where I introduced myself. 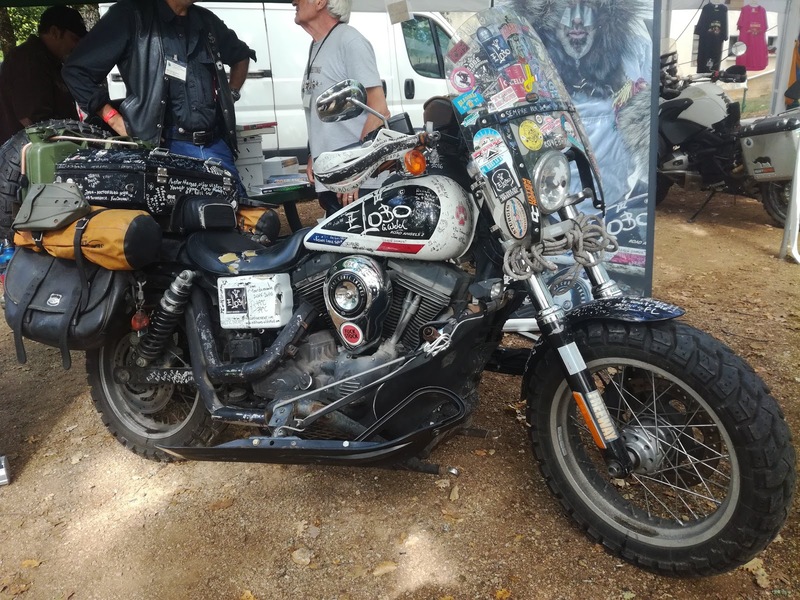 I thought that typical of the esprit de biker of the meeting. 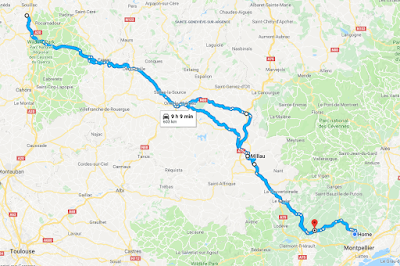 The journey back home was very similar to the one there, but I went via Severac le Chateau and stopped for coffee in Millau. 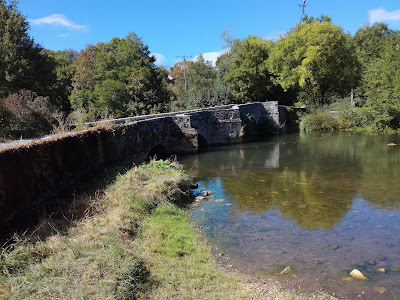 Lunch was taken next to the dinkiest little single track bridge along the road. I sat on the bridge and watched the fish and the ducks and enjoyed the peace and quiet away from the main road. 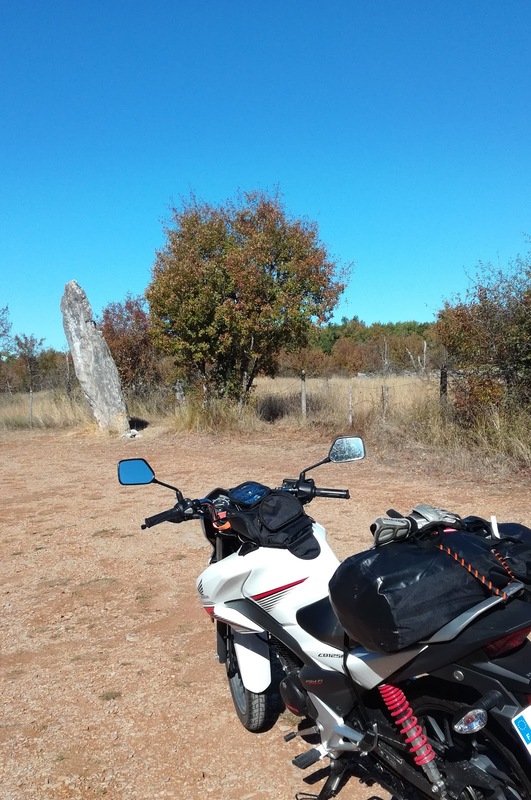 Seen along the way, a menhir 3.5m high. 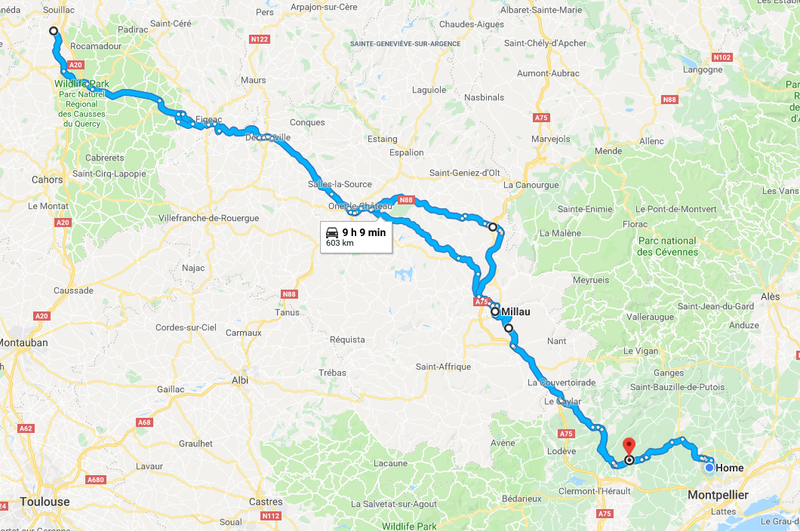 I got stopped along the way too, by the gendarmes who checked my papers and made me blow into a breathalyser near Arboras. The gendarmes were out in force - I saw three lots within a short space of time! The temperature was very different in Hérault and I was very happy to arrive home and shed my leather jacket and trousers, and grab a cool beer from the fridge. It was a fab weekend, with some great people, new friends, lots of ideas and even more dreams. Certainly a birthday weekend to remember! What a wonderful way to celebrate! They sound such a nice crowd, too.